London: Vaudeville Theatre. 26 February to 28 March, 1896. Followed by provincial tour. David Christie Murray (the elder brother of Henry Murray) accused Buchanan of plagiarising his novel, The Way of the World, and there was some correspondence on the matter in The Era. The original inspiration for both Murray’s novel and Buchanan and Jay’s play was Samuel Warren’s novel, Ten Thousand a-Year. I UNDERSTAND that two pieces, both by Mr Robert Buchanan, are before Mr Weedon Grossmith, and that one of them will be the next production at the Vaudeville. The comedies are respectively entitled “Good Old Times” and “The Shop Walker.” They are said to be the survivors of nearly 800 plays by various stage aspirants which this unfortunate manager has had to peruse. Sir,—It is an old adage which says that the world knows more of one’s private business than one does oneself, and the truth is illustrated daily by the extraordinary statements of the theatrical gossip-monger. I see it stated in print to-day that Mr Weedon Grossmith will shortly produce one of two plays, the names of which are incorrectly given, “by Mr Buchanan.” May I ask you to state that, up to the time of writing, I have made no arrangement with Mr Grossmith to produce any work whatever, and that, in any case, I am only the part-author of any work which he may have had under consideration. I strongly object to have my business arrangements anticipated by the writers of newspaper paragraphs, and I also strongly object to have my unborn plays christened for me at the font of the Printer’s Devil. IT is now, we believe, pretty certain that when the Vaudeville reopens the production will be that of a play in which “Charles Marlowe” has again collaborated with Mr Robert Buchanan. THIS announcement effectually disposes of the rumour that The Gay Parisienne would be Mr Weedon Grossmith’s next production at the Vaudeville, where, indeed, our announcement of last week is by way of being verified. Mr Robert Buchanan’s piece has been cast, and is in rehearsal. Miss Palfrey, Miss M. A. Victor, and Miss Annie Hill will be found in the reorganised Vaudeville company. The new comedy by Mr. Robert Buchanan and “Charles Marlowe” (the pseudonym, it is believed, of a lady), authors of “The Strange Adventures of Miss Brown,” is preparing at the Vaudeville. It is to be called “The Romance of the Sleep-walker.” The cast will include Mr. Weedon Grossmith, Miss May Palfrey, Miss M. A. Victor, Miss Nina Boucicault, Mrs. Elwood, and Mr. David James, jun. When I announced that either The Shop Walker or Good Old Times, both by Robert Buchanan, would be the next production at the Vaudeville, the dramatist, with Charles Reade-like vigour, laboured me with abuse – in another paper. Now, however, it appears that The Shopwalker, re-christened The Romance of a Shopwalker, is to be produced on or about Thursday, the 20th inst. The piece is described as a three-act comedy-drama, and the Shopwalker with a romance will be played by Mr. Weedon Grossmith. Others in the cast are: Messrs. Sydney Warden, David James, who is entrusted with a Scotch part (in which he should make a hit), Misses Annie Hill, Nina Boucicault, Talbot, M. A. Victor, and Mrs. Weedon Grossmith (Miss May Palfrey), who will make her welcome reappearance as the heroine. The Romance of a Shopwalker has been written by Robert Buchanan and “Charles Marlowe,” the latter nom de guerre standing, I think, for clever Miss Harriett Jay. The Romance of the Shopwalker is the title of the three act comedy by Mr. Robert Buchanan and Mr. (or is it Miss?) Charles Marlow, promised shortly at the Vaudeville under its present management. The “romance,” as may be imagined, is of a somewhat farcical description, for though there is no reason to suppose that a counter-jumper may not be just as sentimental as any of his customers, it is difficult to get up much emotion over a Tittlebat Titmouse. What a Titmouse, by the way, Mr. Weedon Grossmith would make! Of course he is to be the hero of this new study of various class contrasts, while he will have as associates in the cast Miss May Palfrey and Miss M. A. Victor, both happily recovered from their recent illnesses, Miss Nina Boucicault, Mr. Elwood, and Mr. David James. Long may the little shopwalker go his rounds, and excellent may be his business! Mr. Weedon Grossmith will soon re-open the Vaudeville Theatre with a farce to be called “The Romance of the Shop-walker,” and it is believed that Mr. Robert Buchanan and his literary companion, “Charles Marlow,” have provided the droll little actor-manager with a highly-diverting character. Mr. Weedon Grossmith has arranged to produce “The Romance of the Shopwalker,” the new domestic comedy Messrs. Robert Buchanan and Marlowe have written for him, on Thursday, the 27th inst. In this piece Mr. Grossmith will succeed in getting away from the rôle of the meek little man with a commanding wife—a rôle to which he seemed condemned for all eternity. The piece has a strong dramatic interest, as well as humour, and with the strong company engaged will, it is hoped and expected, attain the success every one would like to see associated with the names of Mr. Grossmith and Mr. Buchanan. The story of a sudden accession of wealth has been employed in many forms by novelists and dramatists of many calibres, from the author of Money downwards, and Mr. Robert Buchanan and his collaborator “Charles Marlowe” (who, when these authors were called last night, proved to be Miss Harriett Jay) have not done amiss in returning to it in The Shopwalker. The time has certainly come when the once familiar story may be told again. It is to be regretted that the authors of The Shopwalker should not have told it better; but there is in this piece, nevertheless, a considerable proportion of the elements that appeal to popular taste. The personage selected for the subject of the experiment of a sudden elevation to wealth is a draper’s assistant, one Thomas Tomkins, who provides Mr. Weedon Grossmith with excellent material for a character sketch, somewhat overdrawn of course, but only the more amusing for that. Tomkins inherits £20,000 a year. In his shop he has ventured, un ver de terre amoureux d’une étoile, to fall in love with a young lady of title who occasionally does business with his firm. This is no other than Lady Evelyn, daughter of the Earl of Doverdale—a part played with the necessary distinction by Miss May Palfrey. For the time being Tomkins’s passion is hopeless, but the death of a wealthy uncle, who leaves him all his property, places him theoretically on a level with the highest in the land. Unfortunately, with all his wealth Tomkins remains a cad of the purest (if not the dirtiest) water, and his suit obtains only the most superficial success. The Lady Evelyn’s affections are placed elsewhere. So, for the matter of that, are Tomkins’s; for in the end the little draper wisely renounces his claims to the hand of the aristocrat and returns to a humble sweetheart with whom he had “kept company” in his shopwalking days. But this is not accomplished until he has had the mortification of being defeated as a candidate for the Parliamentary representation of a local borough. The rough humours of the election fill out the third and last act, but they are not of an exhilarating nature, and they rather accentuate the tendency of the story to drag. It is a pity that the character of the enriched shopwalker should not per se be more interesting than it is; for Mr. Weedon Grossmith elaborates it with infinite care. The authors, however, feel the necessity of developing the sympathetic side of Tomkins’s nature; and accordingly, after renouncing Lady Evelyn’s hand, the little draper makes her a present of her ancestral property which has become his under a mortgage. Miss May Palfrey, Mr. Sydney Warde, Mr. Sydney Brough, and Miss Nina Boucicault sustain with spirit and distinction the aristocratic personnel of the piece; and a strikingly correct study of a Scotch character is given by Mr. David James, as the exalted draper’s man of business, Sandy M’Collop. Miss Annie Hill plays the humble sweetheart with becoming naiveté. The reception of the piece was favourable. Mr. Robert Buchanan and “Charles Marlow”—who now stands revealed in the person of Miss Harriet Jay—have written for Mr. Weedon Grossmith an old-fashioned but pleasant and entertaining comedy, produced at the Vaudeville this evening under the title of “The Romance of the Shop-Walker.” It may be briefly described as Samuel Warren’s “Ten Thousand a Year” with a sympathetic instead of an unsympathetic Tittlebat Titmouse. Mr. Weedon Grossmith plays the millionaire shopwalker with a great deal of humour and, at the close, not without a touch of pathos. Miss May Palfrey is pleasant as the haughty damsel who is on the point of marrying him because his villanous has led her to believe that if she does not he will ruin her impecunious father, and Mr. David James is excellent as the said villanous henchman. Other parts are played by Mr. Sydney Brough, Miss Nina Boucicault, Miss Annie Hill, and Miss M. A. Victor. The play was much applauded, and the call for the authors was unanimous. To give only the outline of the plot of “The Romance of a Shopwalker” would be to bring to the mind of the playgoer many familiar scenes. But it is not so much the story as the manner in which it is told that makes the story as the manner in which it is told that makes the fortunes of a piece. In the latest work of Messrs. Robert Buchanan and “Charles Marlowe” we meet many old friends. There is, to begin with, the young man of humble origin, who has come in for a fortune, and means to make an aristocratic marriage. He is received into the house of a nobleman, who has nothing left to boast of but his family pride. Then there is the haughty earl’s daughter, who rejects the suitor of her choice in order to relieve her father of his financial embarrassments by marrying the uncouth young man, who has secured a mortgage upon her father’s estate. It is in the incidental humours of the piece that the authors have imparted a certain freshness to this romantic story, though the intrigue is conducted in the old-fashioned style, scenes of broad farce alternating with passages of sentiment. The central figure of the play is Thomas Tomkins, a young man who appears to have been born before the era of the School Board. Tomkins is a shopwalker, with a soul above drapery, and a mother in whom the spirit of Mrs. Brown—a type of character of a bygone generation—is revived. Tomkins has fallen desperately in love with the Lady Evelyn Munro, and her appearance in his employer’s shop gives Mr. Weedon Grossmith, who has the chief part, the opportunity for the comic expression of his devotion. His servile adoration of the young lady, his amorous glances, his efforts to suppress his emotion, all this is extremely funny; and Mr. Grossmith is better served by the authors than any other member of the company. With the news that the shopwalker has inherited an enormous fortune the first act closes, and in the second Tomkins, who has invested as much of his wealth as possible upon his personal appearance, is a guest in the Earl of Doverdale’s house, where he is the only person who seems to be at ease. Tomkins is now going into Parliament, and has adopted the Conservative opinions of his host. He leaves that business, however, to his agent—“he knows my political opinions,” as Tomkins says, “so much better than I do”—whilst he attends to his love affairs, in which he is also prompted by his rascally agent, who tells him that the Lady Evelyn returns his affection. Upon this hint Tomkins speaks and in a very funny scene he declares his passion, on his knees. The third act passes to the day of the poll, and Tomkins, who is nervous enough in addressing the electors from the window of the White Hart, plucks up courage when personal references to his mother are introduced, and boldly gives them what he would call a piece of his mind. For Tomkins is not such a paltry creature as he seems, and when he discovers that the Lady Evelyn prefers his first cousin to him, he generously brings the lovers together, and presents the young lady with the mortgage deeds as a wedding present. Then the insignificant little man, who has been the object of everybody’s scorn but his demonstrative mother’s, becomes the admiration of them all, and the newly-elected member of Parliament offers her hand to the shopkeeper’s daughter, who has had all along a forlorn hope of becoming his wife. The romantic sentiment of the piece, it will be seen, is somewhat strained, and the fun lies rather in the ludicrous contrasts of the pushing Tomkins with his surroundings than in the wit of the dialogue, which is not particularly brilliant. Next to Mr. Grossmith, Miss Nina Boucicault contributes the best piece of acting, and it is to be regretted that this vivacious actress is no better employed than in playing the auxiliary part of the younger sister of the Lady Evelyn, who is prettily represented by Miss May Palfrey. Mr. Sydney Brough is the over-bearing young lover, whose insolence cannot be so easily forgiven by the audience as it is by the young lady and the too magnanimous shop-walker. Mr. Sydney Warden plays the Earl of Doverdale, who expresses himself in the stilted style which noblemen commonly use only in books and plays, and talks of “retiring to rest,” when an ordinary mortal would say he was going to bed. 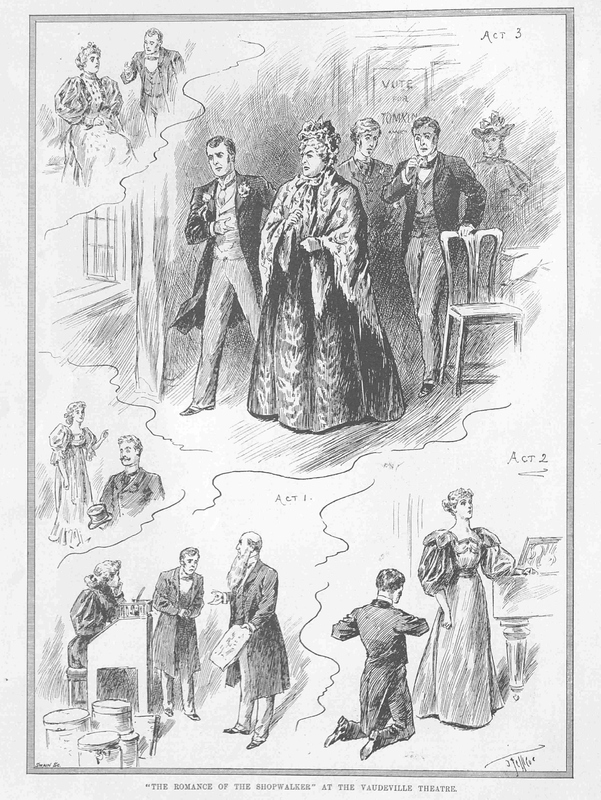 A very amusing sketch of an election agent is given by Mr. David James, and Miss M. A. Victor has the part of the expansive mother. At the end of the performance the authors were called, and the mystery of the identity of “Charles Marlowe” was revealed by the appearance of Miss Harriett Jay with Mr. Buchanan. The man’s the gold for a’ that. As a matter of fact, we opine that perhaps a more appropriate quotation would have been “Tittlebat Titmouse is my name.” Mr. Robert Buchanan is rather fond of seeking and finding inspiration for his “new and original comedies” in old- time novelists’ suggestions. In the present instance the source can be traced, without too deep investigation, to Mr. Samuel Warren’s admirable novel, “Ten Thousand a Year.” Mr. Robert Buchanan and his collaborateuse, Miss Harriet Jay, have doubled the hero’s fortune, and have called him Thomas Tomkins. Therein it seems to us that their claim to novelty and originality cease. Thomas Tomkins is a “Shopwalker,” which is a euphonism apparently for a “counter-jumper.” His “romance” is that he has fallen in love with an earl’s daughter, that by a timeworn accident he inherits a fortune peculiar to the exigencies of dramatic necessity, whereby he is enabled to buy the mortgage deeds of the impoverished earl; and on discovering the fact, which has been patent to the audience all along, that the earl’s daughter loves another and despises him, he sacrifices his romance at the shrine of stage heroism and hands over the mortgage-deeds as a wedding present to the titled girl of his choice, thereby benefiting her not a whit, but doing a distinctly good turn to the noble earl, who has done nothing whatever to deserve this slice of good fortune. There is no pretence on the part of the authors to literary brilliancy. The dialogue is to the point without any attempt at being pointed. The acting is admirable all round. Mr. Weedon Grossmith, as Thomas Tomkins, has evidently made a careful study of a part which requires, and obtains, both delicate and effective handling, on account of its inherent vulgarity, which might prove offensive if not treated with consummate skill. This character is one of the most artistically rendered of the many that Mr. Weedon Grossmith has as yet given us. Mr. David James has never achieved anything better than his conception and execution of Alexander McCollop. In our opinion it was the gem of an all-round excellent exhibition of histrionic skill. Mr. Sydney Brough had little, far too little, to do, but did it convincingly. Miss May Palfrey played the part of Lady Evelyn as well as she looked it, which is according the highest praise to her performance. Miss Nina Boucicault as Lady Mabel was one of the most successful features of the evening. Miss M. A. Victor has far too little to do, but did that little so admirably as to make it a matter of regret on the part of the audience that she was not far more prominently en évidence. Miss Annie Hill, and Miss M. Talbot, Messrs. Sydney Warden, F. Volpe and C. H. Fenton all did excellent service. “The Romance of the Shopwalker” is, to sum up, a play which would be good were it not so conventional, excellently acted, and which should attract during its London run and make an honest success in the provinces. It was enthusiastically received, and everybody, including the authors, were summoned before the curtain for the purpose of receiving the genuine congratulations of the audience. “The Romance of the Shopwalker,” by Robert Buchanan and Charles Marlowe, is an old story retold; it plays upon the contrast between the parvenu without education or manners, but with a true sterling character, and the old family, whose nobility has by degrees parted with the wealth that once sustained it. A play is none the worse for treating a well-worn theme, and the authors have in this case cleverly avoided making their highborn personages heartless or ignoble by introducing a scheming blackguard to whose intrigues the difficulties are due. Tomkins, the shopwalker, is the rising assistant in a draper’s shop, and has grown dearer than he is aware of to Dorothy Hubbard, the proprietor’s daughter, when he falls in love with a picture and a name—with Evelyn, daughter of the Earl of Doverdale, whose portrait he has seen in a Society paper. His silly fancy is in a fair way to ruin his prospects in life; it makes Dorothy miserable, prevents Tomkins from doing his work, and disposes his master to dismiss him. Lady Evelyn visits the shop by way of meeting in the private room her cousin and lover Captain Dudley, and Tomkins, with his head turned, makes himself ridiculous and objectionable to both. His redeeming feature is his honest love for his old mother, preserved in spite of qualities in that estimable lady that scarcely square with his new aristocratic aspirations. Lady Evelyn has hardly left the shop when MacCollop, Tomkins’s friend, rushes in with the news that an uncle has died in the West Indies, leaving Tomkins an immense fortune. In the second act Tomkins, the new millionaire, is a guest at Doverdale Castle. He is kindly treated, and though he is excessively vulgar he has wit enough to see that the environment does not suit him, and to feel that his suit with Lady Evelyn is hopeless. But MacCollop, now his business man, entangles matters for him. Tomkins has bought the mortgages on the Doverdale estates out of sheer good nature, intending to give them to Evelyn on the wedding day he hopes for. But MacCollop betrays the secret by telling Lady Munro—Evelyn’s aunt and the Earl’s sister—that Tomkins has bought the mortgages, and he adds, what is not true, that Tomkins intends to ruin the family unless Evelyn is to be his. The old lady, of course, tells this to Evelyn and to the Earl. The Earl is indignant, and refuses to sell his daughter, but Evelyn thinks she ought to sacrifice herself for her father, and when Tomkins, urged on by more lies from MacCollop, proposes to her, she accepts him. In the third act Tomkins is standing for the borough. The other Party make the most of the supposed purchase of an Earl’s daughter and of Tomkins’s alleged neglect of his mother, which latter charge drives the candidate into his one election speech, a good one, plain and to the point. Tomkins, however, discovers at this stage that the purchase of the mortgages has been divulged, and finds out that Evelyn has accepted him, not for love, but to avert ruin from her family. He has an explanation with her, she admits the truth; and he then releases her, presents her with the mortgages, and joins her hand to Captain Dudley’s. A play like this is not to be taken too seriously; it bears to comedy much the same relation as melodrama bears to tragedy. Subject to the limitations which this classification implies the piece may be said to be good. The authors print on the bill the words of Burns, “The man’s the gold for a’ that,” and they do something more than put sentiments in tune with their motto into the mouths of their characters. They make Tomkins impossibly vulgar, and yet they make him come out well from the trials of his character. The Earl and Lady Evelyn are well drawn on unconventional lines; Dorothy Hubbard and the Widow Tomkins are also quite in order for the stage; the lawyer’s clerk, MacCollop, is sketched with a very broad pencil at some little distance from life. The play may very well become popular, for it is acted as well as it deserves; indeed, it perfectly fits the cast, for which apparently it was written. Mr. Weedon Grossmith is Tomkins, or rather Tomkins is Mr. Weedon Grossmith. No one else could be quite so abject without losing the sympathy of his audience. Mr. Grossmith can be vulgarity itself and yet show throughout the sound heart within. Lady Evelyn was quite admirably played, within the somewhat cast-iron framework of the part, by Miss May Palfrey. Lady Mabel, a younger sister, with occasional sparks of life that might have come from reality, was well done by Miss Nina Boucicault. Dorothy Hubbard receives from Miss Annie Hill several touches of genuine feeling, and Miss M. A. Victor is an overpowering Widow Tomkins without disagreeable exaggeration in the presentment. Mr. Sydney Brough was the lover Captain Dudley, Mr. Sydney Warden the Earl, and Mr. Volpe the master-milliner Hubbard. MacCollop, the Scotch clerk who makes the trouble—a creation far from nice in itself, forming the disagreeable scapegoat of the plot—was played with one of the many varieties of Scotch accent by Mr. David James. The audience liked the play very much; and, of course, called for the actors and for the authors. When the authors were revealed Mr. Buchanan appeared with the lady whose nom-de-guerre is Charles Marlowe. About the middle of the present century, readers of fiction were convulsed with the adventures of Tittlebat Titmouse, a vulgar, red-haired shopkeeper, or something of the kind, who came into the temporary possession of ten thousand a year, aped the country gentleman, sought to marry into the family of a nobleman, stood for Parliament, and ultimately found his practical experience of affluence as illusive and unsubstantial as the dream of Alnaschar, the barber’s fifth brother, over his peripatetic shop of glass and earthenware. These, the main features, if a distant memory serves us well, of Warren’s “Ten Thousand a Year,” serve with some comparatively unimportant modifications for the three-act comedy of Mr. Robert Buchanan and the lady masquerading as Charles Marlowe, produced yesterday evening at the Vaudeville. The character of the hero has been somewhat elevated and sentimentalised. Not quite such a cad as Tittlebat Titmouse is Thomas Tomkins, whose initials, it will be noticed, are the same as those of his predecessor. His origin is, however, equally obscure, he is no less ignorant, vulgar, familiar, and assertive, he has not an “h” in his speech, except in the case of words in which its presence is an impertinence, nor a spark of information or capacity. What he can boast is a vein of sentiment, as misapplied in its direction as it can well be. While walking the shop of Samuel Hubbard, a Dorking linen-draper, he is insensible to the honest, if somewhat inexplicable, affection wasted upon him by Dorothy, his master’s pretty daughter. He dreams of ladies of rank in general, and of Lady Evelyn in particular, the lovely daughter of the proud Earl of Doverdale, and he curses the hard fate that imprisons a soul with aspirations such as his in the body of a linen-draper’s assistant. The coveted prize comes within his reach. By one of those flukes read of in books or dreamed of in dreams, he comes into a property of twenty thousand a year—prices have gone up since the days of Samuel Warren. He is accepted as a guest at Doverdale Castle, and becomes affianced to Lady Evelyn, who, though loathing him and loving her cousin, Captain Dudley, sacrifices herself at the shrine of filial affection, and is ready to marry him in order to regild her father’s tarnished coronet. In the third act, Tomkins stands for Parliament, and makes a fight so gallant that it wins him a portion of public sympathy. Ultimately the glamour under which, for the interested purposes of others, he has been cast is dispelled, he learns the truth concerning his betrothed, releases her from her contract, and with rare magnanimity, on her marriage to his rival, hands her the mortgages upon her father’s estate as a wedding present. Not wholly convincing, though quite sympathetic, are the heroic aspects of little Tomkins. His early aspirations and sorrows are, however, exceedingly amusing, and as a snob he is a gem of the first water. Nothing Mr. Weedon Grossmith has done is better conceived or more finely rendered than this inconceivably vulgar and truculent little cad of a hero. It kept the audience in constant laughter, and is, indeed, in its line, a masterpiece. The play is from its point of view capitally acted throughout. Mr. Sydney Brough is excellent as the soldier lover of the heroine, and Mr. David James is inimitably funny as a Scotch lawyer and election agent. Miss May Palfrey plays in charming fashion the heroine, and Miss Nina Boucicault is inexpressibly pretty and vivacious as her juvenile sister. Re-appearing after an absence that has seemed long, Miss Annie Hill wins all hearts as the forsaken Dorothy, and Miss M. A. Victor is exuberantly amusing as the hero’s vulgar mother. Messrs. Warden, Volpe, and Fenton, and Miss Talbot take part in a performance that is scarcely capable of improvement in any respect. The result is necessarily a success. No customary greeting was wanting, and after Mr. Weedon Grossmith and his clever company had been summoned, Mr. Buchanan appeared, leading on in the person of a lady the Charles Marlowe whose identity has of late been a matter of some curiosity and conjecture. A merry little farce of a wholesome English type, with a dash of pathos thrown in occasionally to relieve the laughter and give the proper dramatic contrast—just the kind of play that delighted London when Robson was at the Olympic and showing his genius in “The Porter’s Knot” and “Daddy Hardacre”—a homely, funny, well-written, and honest little play—such is “The Romance of the Shopwalker,” produced last night. Of course, we have no Robson to play Thomas Tomkins, which is an initial drawback. But the part gives the opportunity which a Robson would have loved to illustrate, for it is a cockney part, a vulgar part, a part that, with all its outrageous excursions into farce, might become almost tragic in its intensity. At any rate “The Romance of the Shopwalker,” such as it is, such as it has been written, such as it turned out as acted, gave, as far as one could see, genuine satisfaction. The first act went with a roar. It is pure farce. The second act, truth to tell, is a little dull, or seemed so, because the majority of the artists were disconcerted. The third act, where farce is turned into pathos, only failed in feebleness of attack. But it did not matter. The house was pleased. There were rapturous calls after every act, and the curtain was twice raised in order to show the beaming countenance of Robert Buchanan, accompanied by “Charles Marlowe,” who to those familiar with her face looked uncommonly like the once favourite actress and authoress, Miss Harriett Jay. Conceive Weedon Grossmith, with all his acquired sense of downright cockney fun, as the shopwalker of a small draper’s shop at Dorking. Thomas Tomkins is a funny but gloomy sentimentalist, and he has fallen in love with the beautiful daughter of the Earl of Doverdale, who lives in the neighbourhood, drives periodically through the town, and buys occasional scraps of ribbon and chiffon at the suburban “Bon Marché.” Tomkins, alias Weedon Grossmith, is in a desperate plight. His sentimental fit irritates his master, breaks the heart of his master’s daughter, worries his poor old mother, and bores his fellow-counterjumpers. At the nick of time, Thomas Tomkins the Shopwalker comes into a fortune of £20,000 a year. The situation is worked up with spirit, and the curtain falls on an admirable farce. All the details of emporium life are well studied, and the whole thing, so far, has been bright and exhilarating. And when the curtain has fallen it flashes through the memory, Did not Samuel Warren, Q.C., once write a celebrated novel called “£10,000 a Year,” and what was it all about? Tittlebat Titmouse, a linendraper’s shopman promoted to a fortune of precisely that amount of income. It seems to us that this was something like a prototype of Thomas Tomkins, who found that the money he suddenly inherited did not bring him the happiness or even the love he desired. But that does not matter. We have to deal with Thomas Tomkins, the Dorking Shopwalker. His wealth gives him such a position in society that he is invited down to stay at Doverdale Castle and is encouraged to make love to the beautiful Lady Evelyn. The Earl is in low water, and the irrepressible Tomkins buys up the mortgage in order to win his bride and free her father. The Lady Evelyn, mistaking poor Tommy’s generous impulses, consents to marry him for purposes of her own. Tommy the Shopwalker stands at a general election for his native town of Dorking, is returned at the head of the poll, discovers that the Lady Evelyn despises him, hands her over to the cousin she loves, and goes back to the little shop with his good old mother and the tradesman’s daughter, who will make him an excellent wife. It is a simple tale with a good deal of fun and plenty of heart in it. The fun, on the whole, comes out better than the pathos. Mr. Weedon Grossmith is a past-master in the art of comic despair. Hitherto he has merely been crushed and coerced and generally “sat upon,” but in this case he gives to sentiment an accent of profound grief. With all his affectations and solecisms and humorous peevishness, poor little Tommy is a good little fellow at heart. He loves his old mother and is not ashamed of her; he never does a dirty trick, and in the hands of Mr. Weedon Grossmith he is a most amusing figure. There were chances, of course, in the last act for a still higher flight of art, and this is why we mentioned Robson at the outset. The authors have written a scene in the last act that Robson would not have despised. The scene was there, but the acting of it was postponed. However, it went very well as it was, and very few knew enough about acting to believe what it might have been. The opportunity was there, but not the result of the opportunity. Very little fault indeed, if any, could be found in the general acting. Miss Nina Boucicault once more showed in a very small character that in her we have one of the comedy actresses of the future, and Mr. David James has the genuine instinct of a comedian which cannot fail to make its mark. These two young people will be heard of, if we mistake not, in the “coming by-and-by.” Miss May Palfrey was charming, sweet, and properly worried as the poor girl who detests the little cad of a shopkeeper, and Miss M. A. Victor gave another touch of fine comedy as the homely, loving, and old-fashioned old mother, in an alarming skirt and a rare old Indian shawl, dating from the middle of the century. Mr. Sydney Brough, manly and earnest, Mr. Frederick Volpe, careful and observant of nice shades of character, and Miss M. Talbot, a handsome old lady, with refinement and presence, all helped the little play on its road to success. The future depends on itself. The only fear is that the acting at vital moments is not quite strong enough for the subject. The farce succeeds; the pathos sometimes breaks down. The fortune of the new “Romance of the Shopwalker,” produced at the Vaudeville, was never in doubt. From the raising of the curtain to the falling of the same the house was kept in a flutter of merriment. It was not only that Mr. Weedon Grossmith had given us the character of an ideal shopman with ambitious yearnings, but the other characters also were full of life and originality. There was Miss Victor, an extraordinary old lady, whose homeliness was only exceeded by her affection for her son; there was Mr. David James’s McKillop, a Scotch clerk; also the matter-of-fact shopkeeper, the crafty lawyer, and Dorothy Hubbard, the lovable daughter of the proprietor, prettily impersonated by Miss Annie Hill. The story of the play is of the shopwalker’s aspirations, and his killing affection for the lovely daughter of the Earl of Doverdale. This, of course, was the part assigned to Miss May Palfrey, who looked the part to perfection, and wore several costumes faultless in tone and beauty. “Oh, that I were nobly born,” was the frequently-uttered cry of Tompkins, the shopwalker. You may fancy the fervour with which the dapper little man, as Mr. Weedon Grossmith presented him to us, uttered this soulful cry. Nor need one describe the ecstacy with which he received the intimation that an uncle had left him heir to twenty thousand a year and accumulations. Tompkins in the second act, as the man of fortune, was, of course, a very different man to Tompkins the shopwalker. He was, if anything, more amusing, although the act was streaked with seriousness, in that the beauteous Lady Evelyn, to save the impecunious peer, her papa, had consented to become Mr. Tompkins’ own, thereby sacrificing her own happiness with the handsome and also impecunious cousin, capably presented by Mr. Sydney Brough. The third act, with all the humour of an election, witnesses, of course, the fall of Tompkins’s matrimonial castle in the air, and the pairing of the young people in proper order—Dorothy, the shopkeeper’s daughter, to the shopwalker, and Lady Evelyn to the handsome captain. Mr. Robert Buchanan and Mr. Charles Marlowe are to be congratulated on the success of their play, and Mr. Weedon Grossmith also on the acquisition of a part that fits him like a glove. The reception of the play was enthusiastic. With Mr. Weedon Grossmith in the chief rôle, supported by a talented company, which includes Miss Annie Hill, Miss May Palfrey, Miss M. A. Victor, Mr. Sydney Warden, and Mr. Sydney Brough, the new three-act comedy at the Vaudeville, entitled “The Romance of the Shopwalker,” is a very amusing piece, and is likely to have a good run. The authors, Mr. Robert Buchanan and “Charles Marlowe” (Miss Harriett Jay), have made a funny character of the shopwalker of the Dorking Bon Marché, who falls in love with a lady of title, comes into a fortune, stands for Parliament, and subsequently marries his master’s daughter. The farce was first produced at Colchester on Monday, and was introduced to London last night with great success. “THE ROMANCE OF THE SHOPWALKER.”—The new comedy, by Robert Buchanan and Chas. Marlowe, was produced for the first time on any stage at Colchester Theatre on Monday evening by Mr. Weedon Grossmith and his entire London company, by whom it was to be played at the Vaudeville Theatre, London, on Wednesday. The caste included Mr. Weedon Grossmith, Mr. Sydney Warden, Mr. Sydney Brough, Mr. Fredk. Volfe, Mr. David James, Miss Talbot, Miss May Polfrey, Miss Nina Boucicault, Miss Annie Hill, and Miss M. A. Victor. In the new piece, “The Romance of the Shopwalker,” which was brought out with success at the Vaudeville the other night, Mr Robert Buchanan and his lady collaborateur, who assumed the nom de plume of “Charles Marlowe,” seemed to have borrowed a few hints from Warren’s “Ten Thousand a Year.” The hero, Thomas Tompkins, passed through experiences akin to those of Tittlebat Titmouse, and with very similar results. The play is admirably acted by Mr Weedon Grossmith and his company. "The Romance of the Shopwalker." In the novel of “Ten Thousand a Year,” fortune suddenly smiles upon one of humble origin. The authors of the new Vaudeville play (MM. Robert Buchanan and Charles Marlowe) have doubled that amount, and it is to the tune of £20,000 a year that Thomas Tomkins, his soul “rising and fermenting” beneath his romantic waistcoat, proudly steps into “high life.” His imagination fired by novelette-reading, he no longer deigns to notice sweet Dorothy, daughter of the owner of the Dorking Bon Marché, but aspires to the hand of Lady Evelyn, who naturally prefers her cousin, Captain Dudley. Very amusingly are the pretentious Tomkins and his plebeian mother held up to ridicule. Much fun is made of the snobbish hero’s standing for Parliament; and a good point secured by his access of generosity to Lady Evelyn, and his ultimate pairing with Dorothy. As mother and son, Miss M. A. Victor and Mr. Weedon Grossmith are fairly in their element. Mr. David James makes a hit as MacCollop, the designing Scot. Needless to add, Miss May Palfrey charms everyone as Lady Evelyn, for this fair young actress is one of the prettiest and most captivating ladies on the stage. With Miss Palfrey may be coupled the fascinating Dorothy of Miss Annie Hill and the Lady Mabel of Miss Nina Boucicault; and Mr. Frederick Volpé and Mr. Sydney Brough make their mark as the proprietor of the Bon Marché and the lucky Captain of this exceedingly droll and diverting comedy. No special erudition and experience would be needed to point out the resemblance between The Romance of the Shopwalker—which had preliminary production at the Theatre Royal, Colchester, on Monday—and previous plays. It reminds one of The Parvenu in plot, and of Samuel Warren’s novel of “Ten Thousand a-Year” in the character of its hero. After all, what do these reminiscences matter? The important fact in connection with Mr Robert Buchanan and Mr “Charles Marlowe’s” piece is that it gave us a merry two hours and a-half at the vaudeville Theatre on Wednesday, evoked a great deal of laughter, and trembled, at times, on the verge of pathos. Indeed, the chief fault lay with the audience, who were inclined to see only the ridiculous side of Thomas Tomkins’s adventures, and often laughed in the wrong place. But we must take out audiences as we find them, shallowness, prejudices, and all; and we counsel Mr Buchanan and his collaborator to humour their patrons by removing a few of the liens in which Tomkins asserts his good qualities. Thomas Tomkins is the shopwalker in the establishment of Mr Samuel Hubbard, haberdasher, of the “Bon Marché,” Dorking. Dorothy, Hubbard’s daughter, has a tender place in her heart for the employee, but he has fixed his affections upon beautiful Lady Evelyn Doverdale, daughter of the Earl of Doverdale. Evelyn, who is already attached to her poor cousin, Captain Dudley, comes to Hubbard’s shop, and, by pretending to faint, is conducted into Hubbard’s parlour, where she meets the Captain surreptitiously. The interview between the lovers is interrupted by the return of the Earl and his sister, Lady Munro, and Evelyn is taken home in disgrace. Alexander McCollop, a lawyer’s clerk, and Tomkins’s bosom friend, comes to tell him that a relative has left him a fortune of £20,000 a-year, and the act ends with the jubilation of the shopwalker and his friends. In the second act we find him in all the glories of overdress and evening dress in the drawing-room at Doverdale Castle. He has put up as a candidate for the county; and, out of pure good-nature and love for Lady Evelyn, has bought up the heavy mortgages upon the Doverdale estates, and intends to present them to the Earl. Egged on by the subtle McCollop, who wants the match between Tomkins and Lady Evelyn to come off so that he (McCollop) may marry Dorothy Hubbard, the ex-shopwalker proposes to the lady. McCollop has obtained the reluctant support of Lady Munro by telling her that Tomkins will foreclose on the mortgage immediately if he is refused. Lady Evelyn is thus made to believe that her self-sacrifice alone can save her father from beggary, and she gives her hand to Tomkins, who is enraptured. The scene of the last act is a room in the White Hart, Dorking. It is the day of the election, and the usual amenities are being exchanged between the supporters of the rival combatants. A slander has been put about to the effect that Tomkins, who is in reality the best of sons, is allowing his old mother a paltry stipend out of his wealth, and this calumny is cast in Tomkins’s teeth when he makes his speech to the electors. He loses his temper, shows the old lady to the mob radiant in glorious and expensive raiment, denounces them for their false and cowardly detractions, and ends by telling them that he doesn’t want to be their member. McCollop, pressing his advances upon Dorothy, is overheard by Lady Mabel, the younger daughter, who exposes the canny Scotchman’s trickery, and he is cast off by Tomkins, who, though he wins his election, renounces his claim on Lady Evelyn’s hand, gives her the mortgage deed, and announces his intention of retiring to the class from which he came. To state that the all-important part of Thomas Tomkins was sustained by Mr Weedon Grossmith is to assure out readers that an interpretation of exquisite comicality was presented by that quaint and curious comedian. There is something so admirably suitable in Mr Grossmith’s “means” to the portrayal of a character of the typical shopman or valet, that when we see him in a part of this class we are inclined to wish that he might ever “do nothing but that.” And Mr Grossmith’s analysis of such characters is not superficial. He gives us the so-called “snob” in his entirety, and, while accentuating all the comic details, does not neglect the essential characteristics. His impersonation of the vulgar, uninformed, but chivalrous shopwalker was irresistible in its drollery. The oddities of diction and manner of Tomkins were adroitly indicated, and full justice was done to the pathetic side of his position. Mr Sydney Warden made an aristocratic Earl of Doverdale, and Mr Sydney Brough’s Captain Dudley was unimpeachable in its frank, gentlemanly ease. Mr Frederick Volpe was quite realistic as the Dorking haberdasher; and Mr David James gave a smooth, polished, and effective performance as Alexander McCollop. The small part of Mr Catchem was carefully played by Mr C. H. Fenton, and the butler, Coningsby, had a suitable representative in Mr T. Hesslewood. Miss M. Talbot was pleasant and ladylike as Lady Munro. Miss May Palfrey did all that could well be done with the trite rôle of Lady Evelyn, and Miss Nina Boucicault gave a charmingly crisp, dainty, and vivid performance of the part of Lady Mabel. Miss Annie Hill was appropriately simple and quiet as Dorothy, and Miss M. A. Victor convulsed the audience completely by her comical appearance and admirable acting as Mrs Tomkins. The Romance of the Shopwalker was received with loud laughter and hearty applause. It was preceded by Mr H. M. Pauli’s comedietta, in one act, entitled Merrifield’s Ghost, the only change in the cast from that of its production at this theatre on Nov. 13th last being in the assumption by Mr E, Ferris of the rôle of Will Gordon, formerly sustained by Mr Wilfred Draycott. Mr Ferris gave a spirited embodiment of the architect’s son, and Mr Sydney Warden, though his appearance was not sufficiently old, acted well as the Ghost. There are some actors so physically suited to well-known characters in fiction that they actually suggest a play before it is even written. Take the characters of Dickens alone. Samuel Emery was a born Peggotty. You could not look upon John Clarke without thinking of Quilp, George Fawcett Rowe could not fail to succeed as Micawber, and Miss Jennie Lee, as Jo, simply walked out of “Bleak House” on to the stage. It was not strange, therefore, that Mr. Weedon Grossmith should have been implored by his best friends, for eight or nine years past, to look at Samuel Warren’s “Ten Thousand a Year,” and see if Tittlebat Titmouse, the little Cockney draper’s assistant who comes into a fortune, goes into society, falls in love with a well-bred woman, and eventually reigns her from a generous motive, would not suit him “down to the ground.” His invariable answer has been, “If someone would write a play on the subject, I should like to have it.” So far it went and no further. Scenarios were suggested, but never written; scenarios were sent in, but in such a sketchy form that they were valueless. The subject was in the air, and the tangible play was never forthcoming until Robert Buchanan and Miss Harriett Jay offered to the management a work in a fit state to be considered. This, of course, was “The Romance of the Shopwalker,” which was read, accepted, rehearsed, and successfully acted. Whereupon the inevitable happened. All who intended to give a Tittlebat Titmouse to the stage and didn’t are angry because someone else forestalled them, not with a scenarios, which could be found by any amateur in the book, but with a play that couldn’t So, for the moment, the air is full of rumours and dark threats, at which the little Tittlebat Titmouse very sensibly laughs, and so do author and authoress, who naturally win because they raced like the hare and did not go to sleep like the tortoise. 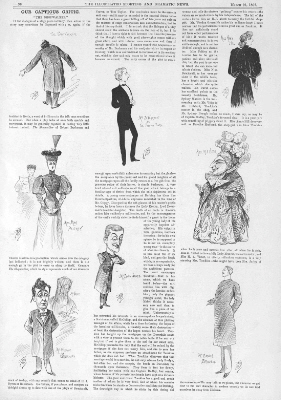 MR. ROBERT BUCHANAN and Miss Harriet Jay, who is the Charles Marlowe of the collaboration, have gone to Samuel Warren’s admirable novel, “Ten Thousand a Year,” for the basis of their domestic comedy, The Romance of the Shopwalker, produced on Wednesday evening last by Mr. Weedon Grossmith at the Vaudeville Theatre with every sign of success. TITTLEBAT TITMOUSE not unnaturally suggested to the authors a capital prototype for Mr. Weedon Grossmiths’s idiosyncrasies, and Tittlebat Titmouse accordingly he is in the play, with the exception that he has been rechristened Thomas Tomkins. His fortune has been doubled by the authors, and he has to go through the whole gamut of conventionality in the course of his three hours’ existence on the boards. THE collaborators have certainly failed to display much ingenuity in their treatment of such trite themes as an impoverished Earl with two marriageable daughters, the elder of whom, though deeply attached to a penniless cousin, is willing to sacrifice herself on the shrine of matrimony to the vulgar little parvenu, whose heart is as big as his body, and who buys up the dear old familiar mortgage deeds of the impecunious nobleman to save him on account of his daughter, whom the tender-hearted little vulgarian imagines he adores. THE great fault of the author’s work is that all the characters are, if not impossible, extremely unnatural. A man with such an outrageous coating of vulgarity would be quite impossible nowadays in a position of prominence and trust in such an establishment as even the Dorking Bon Marché. The son of a respectable chemist and druggist in these days would have received an education that must have toned down a vast amount of his blatant vulgarity, and the deceased chemist and druggist during his married life would have certainly eliminated much of the commencement de siècle flavour of the partner of his sorrows and joys, as represented by Miss M. A. Victor. THE chief merits which outweigh the faults of the piece are the wholesome tone of the play and the genuine fun that exists in considerable profusion throughout. The comedy element is the strong part of the play; in the more serious portions the authors are not so felicitous, nor is Mr. Weedon Grossmith at home. For this reason it would be well for him to cut down the would-be pathos of the end of the last act as much as possible, for as given on the first night it appeared tediously redundant and tautologic. IT is only in this portion of the character that Mr. Grossmith is not absolutely excellent. It is not his fault that the authors have laid on the vulgarity with a trowel instead of with a brush; but it is due to him that the comic features of the character are emphasised. Miss may Palfrey gives a charming performance of the Earl’s daughter. It is a line in which we have not hitherto seen her, and in which she proves herself as completely proficient as in the lines she has previously so well succeeded. IN my opinion the two best performances in the piece, if it is not invidious to say such a thing where all are good, are those of Miss Nina Boucicault, as the Lady Mabel, and of Mr. David James, as Andrew McKollop. Miss Nina Boucicault’s performance is brimming over with saucy humour, although the part is but a very insignificant one in point of length. Mr. David James’s Scotch agent is an admirable study of character admirably portrayed. MISS VICTOR has far too little to do, but what she has is as good as can be. Mr. Sydney Brough is completely thrown away on the colourless part of Captain Dudley. Mr. Frederick Volpe gives a clever little sketch of Samuel Hubbard, proprietor of the Dorking Bon Marché. Mr. Sydney Warden, as the Earl of Doverdale, succeeds in investing a conventional part with some semblance of character. Miss M. Talbot is well in the picture as the scheming Lady Munro, and Miss Annie Hill is ill-served by the authors, but makes the most possible out of the doleful Dorothy Hubbard, who cherishes a secret affection for the little shop-walker. THE play was received with most cordial demonstrations of genuine approval, actors and authors receiving double calls at the fall of the curtain. Mr. Weedon Grossmith should do well with his new play both in London and in the provinces. NEW PLAY AT THE VAUDEVILLE THEATRE. The Romance of the Shopwalker, a new comedy by Messrs. Robert Buchanan and Charles Marlowe, was produced with every sign of success at the Vaudeville on Wednesday night. There is nothing in it that is very new, and very little that is true in the sense of being accurate in its study of the life and character depicted. But, on the other hand, there is plenty that is entertaining in its straightforward and rather old-fashioned way, while there is exactly the hint of homely pathos which people like to find underlying humour of the domestic order. The plot is thin, but just sufficient to afford material for three short acts; and the dialogue, if not brilliant, is fairly equal to the demands of a not too exacting occasion. The shopwalker with whose romance the story deals is Mr. Thomas Tomkins, an employé in the Bon Marché at Dorking; and Tomkins’s romance is, as might be expected, quite of the “London Journal” stamp. Instead of falling in love, as he should, with his master’s very friendly daughter Dorothy, the silly Tomkins worships from afar the beautiful and haughty Lady Evelyn, whose portrait has captivated him when he has seen it in the illustrated fashion-papers. Her ladyship, when she drives over from Doverdale Castle to shop at the Bon Marché, never even notices the obsequious little man who makes sheep’s eyes at her as he stands with his pencil behind his ear, anxiously anticipating her every wish. She enters the parlour behind the shop, but it is only for a surreptitious meeting with her cousin Captain Dudley, whom her father has forbidden her to marry by reason of his poverty. Tomkins’s insane jealousy during this stolen interview is agonising in the serio-comedy of its expression, which, as may be imagined, suits admirably the quaint lachrymose humour of Mr. Weedon Grossmith. Equally acute is his satisfaction when his friend MacCollop, a shrewd lawyer’s clerk, announces to him that, like his prototype Tittlebat Titmouse, he is heir to a large fortune. The motive of the story is, as will be seen, very nearly akin to that of Dr. Warren’s once famous novel “Ten Thousand a Year”; and considerations of space forbid our attempting to repeat at length the details of its elaboration. Suffice it to say that Tomkins’s wealth enables him to become not only member for his borough, but accepted suitor for the hand of Lady Evelyn, who promises him her hand only to save her needy father, the Earl of Doverdale, from ruin. Tomkins, however, is too foolish in his happiness to guess this, or to know that both he and his fiancée are the victims of the unscrupulous scheming of his friend MacCollop. When he finds out his mistake the poor little cad bears his misfortune like a man, declines absolutely to take advantage of his position, and hands over to Lady Evelyn the mortgage-deeds on her father’s estates as a wedding present on her marriage with the man she loves. Mr. Weedon Grossmith is of course the central figure in this trite little piece, and his performance is admirable throughout. The lovers find presentable embodiment at the hands of Miss Palfrey and Mr. Sydney Brough; Mr. David James’s MacCollop is a capital Scotchman, and in other parts the charming light comedy of Miss Nina Boucicault contrasts effectively with the low comedy of Miss M. A. Victor. When the authors were called on for congratulation it was seen that Mr. Buchanan’s colleague, Charles Marlowe, is a lady very like Miss Harriett Jay. FROM this new piece, which was to be produced at the Vaudeville Theatre on Wednesday evening last, we print sketches taken at the dress rehearsal. The story is briefly that of a shopwalker who loves a lady of title and has ambitions of society and political distinction. A legacy of £20,000 a year enables him to attain some of his hopes, though he does not eventually marry the object of his adoration. He is good enough to let her off—although she is willing to sacrifice herself for her impecunious father—on her confession that her heart belongs to another. Our artist has represented: from Act I. the humiliation of the hero—he is reprimanded by the proprietor for reading society papers during business hours; from Act II. his proposal to Lady Evelyn after his accession to wealth; and from Act III. the scene in which, having told the mob to go hang, he is elected M.P. by acclamation on the ground of his independence. The smaller sketches show the incident in which the unscrupulous lawyer, McCollop—who is to have a commission on the aristocratic marriage—secures Lady Munroe’s assistance from the fear of ruin; and Captain Dudley, the favoured lover of the heroine, talking over matters with Lady Mabel, the lively sister of the apparently doomed maiden. The Romance of the Shopwalker: a new and original comedy. By Robert Buchanan and Charles Marlowe. 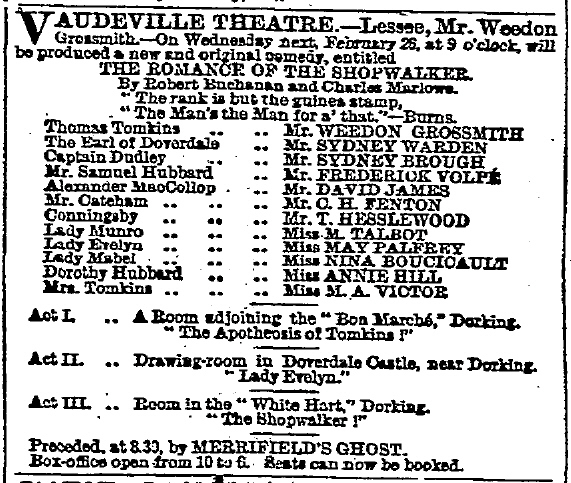 Vaudeville Theatre, 26 February, 1896. I was so sternly reproved for my frivolity in rather liking “The Strange Adventures of Miss Brown,” that I hardly dare to confess that I got on very well also with “The Shopwalker.” I am as well aware as anybody that these Buchanan- Marlowe plays (Marlowe is a lady, by the way) are conventional in the sense that the sympathy they appeal to flows in channels deeply worn by use, and that the romance of them is taken unaffectedly from the Alnaschar dreams of the quite ordinary man. But allow me to point out that this sort of conventionality, obvious and simple as it seems, is not a thing that can be attained without a measure of genius. Most of the plays produced in the course of the year are attempts to do just this apparently simple thing; and most of them fail, not because they aim at realizing the vulgar dream, giving expression to the vulgar feeling, and finding words for the vulgar thought, but because, in spite of their aiming, they miss the mark. It seems so like missing a haystack at ten yards that many critics, unable to believe in such a blunder, write as if the marksman had accomplished his feat, but had bored the spectators by its commonness. They are mistaken: what we are so tired of is the clumsy, stale, stupid, styleless, mannerless, hackneyed devices which we know by experience to be the sure preliminaries to the bungler’s failure. Now Mr. Buchanan does not miss his mark. It is true that he is so colossally lazy, so scandalously and impenitently perfunctory, that it is often astonishing how he gets even on the corner of the target; but he does get there because, having his measure of genius, it is easier to him to hit somewhere than to miss altogether. There is plenty of scamped stuff in “The Shopwalker”: for example, the part of Captain Dudley is nothing short of an insult to the actor, Mr. Sydney Brough; and a good half of the dialogue could be turned out by a man of Mr. Buchanan’s literary power at the rate of three or four thousand words a day. Mr. Pinero or Mr. Jones would shoot themselves rather than throw such copious, careless, unsifted workmanship to the public. But the story is sympathetically imagined; and nearly all the persons of the drama are human. One forgives even Captain Dudley and Lady Evelyn as one forgives the pictures of lovers on a valentine. Mr. Buchanan does not count on your being a snob, and assume that you are ready to sneer at the promoted shopwalker and his old mother: he makes you laugh heartily at them, but not with that hateful, malicious laughter that dishonors and degrades yourself. Consequently there is, for once, some sense in calling a popular play wholesome. All I have to say against “The Shopwalker” is that there is hardly any point on which it might not have been a better play if more trouble had been taken with it; and that a little practical experience of the dramatic side of electioneering would have enabled the authors greatly to condense and intensify the scene in the last act, where the shopwalker, as Parliamentary candidate, produces his mother. It is a mistake, both from the electioneering and poetic point of view, to make Tomkins merely splenetic at this point: he should appeal to the crowd as men, not denounce them as curs. However, Buchanan would not be Buchanan without at least one incontinence of this kind in the course of a play. The acting is excellent, Mr. Grossmith, with all his qualities in easy action, being capitally supported by Miss Victor, Miss Nina Boucicault, and Mr. David James. Miss Palfrey improves, though not quite as fast as she might if she gave her mind to it. Miss Annie Hill is satisfactory as Dorothy Hubbard, but has not much to do. The other parts are mere routine. Mr. Robert Buchanan and Miss Harriett Jay (“Charles Marlowe”) are the co-authors in “The Romance of the Shopwalker,” produced at the Vaudeville on Wednesday evening. The story is very simple, and on an old theme. Thomas Tomkins (Mr. Weedon Grossmith), the shopwalker, has a soul above the counter. He pines for high life and marriage with a nobly-born lady. Luck, in the way of an immense fortune, enables him to taste in reality some of the sweets of his dream. He makes love to Lady Evelyn (Miss May Palfrey), the daughter of an impecunious Earl of Doverdale (Mr. Sydney Warden). By having a mortgage on the estates of the Earl he is able to advance his wooing largely by deputy in the form of an agent, who undertakes the “running” of him in his new sphere of life. Lady Evelyn is beloved of Captain Dudley (Mr. Sydney Brough), whose captaincy is his fortune. She reciprocates the affection. But the stern necessity of her having a wealthy husband brushes away all this sentimental longing, until Mr. Thomas Tomkins himself perceives that he is no proper mate for the fair lady, relieves her, and presents her to the Captain, together with the mortgage on her father’s property. Mr. Weedon Grossmith performs with a comical sort of pathos that is very enticing; and Miss Nina Boucicault as Lady Mabel, sister of Lady Evelyn, shows distinct signs of the highest promise. The others in the bill are Misses Talbot, Annie Hill, and M. A. Victor, and Messrs. David James, F. Volpe, Fenton, Hesslewood, Skinner. Notwithstanding the weakness of the dialogue, the “Romance of a Shopwalker” has numerous good points which ought to bring it wide popularity. The Romance of a Shopwalker is a very amusing homely comedy, containing a capital character for Mr. Weedon Grossmith. The piece is constructed on the simple and straightforward plan pursued by the late H. J. Byron, and the principals in the action are on the whole well drawn. It sets forth the adventures of Thomas Tomkins, a youthful shopwalker in a drapery establishment, who with no special advantages either of appearances or of education fancies himself in love with the Lady Evelyn. Unexpectedly coming into a large fortune he presses his suit and also aspires to become a member of Parliament, but he soon perceives that those who are most ready to prey upon his good nature are the quickest to ridicule his pretensions to move in aristocratic circles. He submits to ill-disguised contempt until reference is made to his humble mother, whereupon in manly fashion he turns upon his persecutors and heaps coals of fire upon their heads by generous actions preparatory to settling down with his late employer’s daughter, who has long secretly loved him. The assertiveness, alternating with servility, of Tomkins, affords Mr. Weedon Grossmith numerous opportunities of displaying the peculiar vein of humour in which he has scarcely a rival, and the illustration of the youth’s indignation when his eyes are opened to the insincerity of his new friends is not lacking in dramatic force. Miss M. A. Victor (as the kindly, old-fashioned mother), Miss May Palfrey, and Mr. Sydney Brough (as Lady Evelyn and her lover), Mr. David James (as an election agent), Miss Nina Boucicault, and Mr. Sydney Warden give excellent support. When the authors were on Wednesday loudly summoned Mr. Robert Buchanan appeared with Miss Harriett Jay. MISS MAY PALFREY, who shares with her husband, Mr Weedon Grossmith, the principal honours in “The Romance of a Shopwalker,” the new play by Mr Robert Buchanan and Charles Marlowe (Miss Harriet Jay) wears (writes a lady correspondent) some pretty dresses in her rôle of the Shop-walker’s aristocratic fiancée. In the first act Lady Evelyn, who enters the room behind the draper’s counter on pretext of a fainting fit, wears a dainty white poplin gown with full skirt, the bodice draped with a coffee-tinted chiffon, and lace fichu drawn through the waistbelt. The picture hat has clusters of rich crimson roses. Miss Nina Boucicault, who plays delightfully as the hoydenish young sister of Lady Evelyn, wears a very girlish frock of pink silk made in smock fashion, with Mother Hubbard sleeves and a large frilled fichu of white chiffon tied at the back and falling in long ends. The wide-brimmed hat of pink drawn tulle is trimmed with roses. The second act passes in a prettily-staged drawing-room, with old family portraits and softly-shaded lamps. Lady Evelyn’s evening dress of white satin has a tinge of pink from the pink silk lining. The square-cut corsage is trimmed with a thick ruche of rose-pink chiffon, and a scarf of the same material is wound round the waist and tied at the left side. The bishop sleeves are also of pink chiffon and on each shoulder is a large bow of white satin lined with pink. In the same scene Miss Boucicault wears a dress that would be very suitable for a young girl’s party frock. It is in soft white silk and is hung from a yoke of silver sequin passementerie. The hem of the skirt is softened with a lace frill. Bands of silver sequin embroidery hang loosely from the shoulders down the front of the dress. A white ribbon tied in the flowing hair is in harmony with the simple dress. In the last scene—a room in the White Hart Inn, from the window of which the Shop-walker candidate for Parliamentary honours addresses his electors—Miss Palfrey wears a pelisse of electric blue cloth with yoke of black passementerie and large bishop sleeves, the bodice of the pelisse crossing to one side in soft folds. Miss Boucicault’s tailor-made dress of forest green cloth has the newest jacket—the short loose sacque with double-breasted front. It has large lapels and pointed gauntlet cuffs of white cloth, sewn with sequins. Miss Victor, who plays admirably as the simple old countrywoman, the mother of the Shop-walker, dresses the part to perfection in Paisley plaids of a bygone era, dresses of fearful and wonderful patterns, and coal-scuttle bonnets laden with feathers and flowers, her appearance in the election scene being such as to fully warrant the attention that she is supposed to have attracted from the electioneering mob. “THE ROMANCE OF A SHOPWALKER,” AT THE VAUDEVILLE. It may fairly be imagined that the new piece by Mr. Robert Buchanan and Miss Harriet Jay has been written actually for Mr. Weedon Grossmith. The part of Timothy Tomkins has, apparently, been drawn purposely to exhibit his peculiar gifts, and, in consequence, he is interesting and amusing throughout the evening. It is also true, however, that, while the actor seems to have “got into the skin of the part,” he does not quite get hold of its heart, and, in consequence, his scenes of love, passion, and renunciation were not very effective—were, indeed, slightly amateurish and uninteresting, while there was hardly enough “lift” in his emotion at the end of the first act. Nevertheless, his suggestions and manner and character were remarkably clever, and he showed most ingeniously how the airs and graces of the shop clung to him even after he had cut the Bon Marché. A somewhat curious question may be asked in relation to the piece. In it a somewhat merciless exhibition of the manners and unconscious humours of the shopkeeping class: a large proportion of the audience must come from this class. Does this large proportion laugh at Mr. Grossmith, regarding his work as mere caricature, or are its withers wrung at all? I fancy that, if I were a respectable young shopwalker, and not a poor devil of a critic, I should squirm a little at the obsequious politeness of Tomkins, and at his Bon Marché bows and gestures, unless, of course, they seemed natural and proper to me, and, therefore, not at all amusing. Of course, we are all like the Pharisee, strangely ingenious in not perceiving the fact that we have ourselves the faults we see in others. Certainly I know one man of letters who makes fun out of the social solecisms of others, and yet has himself no better manners than the pig that he imitates in mode of eating—No, I am unjust to the pig! it does not take pieces off its plate with its fingers, or do Cinquevalli feats of balancing peas on its knife before putting them and their dangerous vehicle into its mouth. I was surprised, when speaking of the play, to hear one critic, usually severe and not easily entertained, say that he found it rather amusing, and another of the unholy fraternity call it a “record of ineptitude.” It shook my views. I had found the first act funny, the second act dull, and the third half-and-half, and so began to wonder whether the want of ingenuity should have stayed my laughter at the beginning, or whether the heavy love-comedy scenes really possessed a subtlety and skill that I had overlooked, wherefore I am in a state of pure perplexity. The audience, however, had no doubts, for it seemed to be amused from first to last, and it even found laughter for a famous old joke about the fact that it is not money, but the want of it, which is terrible. It is a pity that some of the minor parts were not more developed. Miss Nina Boucicault promised to be amusing, but her chance never came, and the charming, clever young actress had her efforts unrewarded. Mr. Sydney Brough popped in and out without getting a scene. On the other hand, Miss May Palfrey had a somewhat overburdening part, and, though she played pleasantly, did not make the most of her chances. Mr. David James, no longer, alas! “junior,” had a good part, and played ingeniously; and work of some skill was done by Mr. Sydney Warden and Mr. Volpe. An agreeable, unpretending piece of work is The Romance of the Shopwalker, by Mr. Robert Buchanan and “Charles Marlowe” (Miss Harriet Jay), at the Vaudeville. The story has been told a hundred times; the ready-made characters appeal direct to the ready-made sympathies of the average audience; and yet the “romance” (for it really deserves its title) is so genial and humane that I was thoroughly amused and, in the third act, even moved by it. There is a touch of delightful irony in the interruption of one of the Shopwalker’s rhapsodies about “all men being equal in the sight of Heaven,” by the curt demand, “Sign, please!” The whole first act, indeed, is bright, novel, and entertaining. The second is more conventional, and even becomes painful at times; but the third is really dramatic, the contrast between Tomkins’s two harangues to the crowd being excellently imagined. Mr. Bernard Shaw, I observe, seems to bracket this play with its predecessor from the same pens, and to feel, somehow or other, that the merits of The Shopwalker justify his inexplicable tenderness towards Miss Brown. Let him contrast what the authors have done for Mr. Weedon Grossmith with what they did for Mr. Fred Kerr, and he will surely realise the difference between the two pieces. To Mr. Grossmith the authors have given an opportunity for a genuine character-creation, a performance which shows his admirable talent in its most favourable light. Of Mr. Kerr—also an excellent comedian—they made a pitiable laughing- stock, obscuring his talent, and subjecting him to senseless indignities such as account, in great measure, for the instinctive disesteem in which the world has always held the actor’s calling. For my part, I shall long retain a kindly remembrance of Mr. Grossmith’s Thomas Tomkins; when I think of “Miss Brown,” I blush for my species. Mr. David James was clever as Tomkins’s Mephistopheles, and his Scotch was above reproach except for a single superfluous letter. Birnam Wood shall come to Dunsinane ere an authentic Scot shall be heard to say “stigmar upon.” Miss M. A. Victor gave a highly- coloured portrait of the Shopwalker’s mother, Miss May Palfrey was pleasant as the haughty Lady Evelyn, and Miss Nina Boucicault made a real character of the vivacious Lady Mabel. Some of the critics have fallen foul of Mr. Robert Buchanan, because his amusing comedy written for Mr. Weedon Grossmith at the Vaudeville appears to bear some resemblance to Warren’s famous novel, “Ten Thousand a Year.” I suppose they will next assault the dramatist’s originality because of a singular coincidence that occurs with respect to the name of one of the characters. The “Shopwalker” serves in the drapery establishment of Mr. Samuel Hubbard, of Dorking. That is in the play. Now it happens that there is a tradesman at Dorking whose name is Hubbard. It is true that he is a jeweller and not a draper. But that is a detail which will not interfere with the critical judgment that the names are not original. Of course, the good people at Dorking will have it that their Mr. Hubbard is the man meant in the play. “The Romance of a Shop-walker,” by Robert Buchanan and Charles Marlowe, in which Weedon Grossmith is acting at the London Vaudeville Theatre, resembles, in plot and incidents, the comic piece Emma Sheridan Frye wrote for Richard Mansfield on the basis of Samuel Warren’s “Ten Thousand a Year.” The young cockney shopman, in love with his employer’s daughter, is suddenly raised to affluence, and betrothed to a peer’s daughter, whom he afterward releases to return to his former sweetheart; the comic electioneering scene, and the treacherous friend who tries to use the hero’s wealth for his own ends, are all in it. Of course, “The Romance of a Shop-walker” is not a dramatization of Warren’s satirical tale, but neither was Mrs. Frye’s play, properly speaking. Persons in the British Metropolis. Weedon Grossmith’s latest vaudeville venture, The Romance of the Shopwalker aforesaid, was warmly welcomed— perhaps on the score of coming in the guise of an old or rather of several old friends—for this latest new work by Robert Buchanan and Charles Marlowe (otherwise Harriet Jay) reminded friends in front of many a favorite play by H. J. Byron, H. T. Craven, Andrew Halliday and others, with a large infusion of Robertson’s Society. Of course, the new play was none the worse for reminding us of such healthy, if often artless, works. Indeed, it was a refreshing change after the doses of “problem” and “sexual” mixtures which have been lately shed upon us. THERE is trouble between Mr. David Christie Murray, as author of a story called “The Way of the World,” and Messrs. Robert Buchanan and Charles Marlowe, as authors of The Shopwalker, with regard to the sources of their respective works. Mr. Christie Murray says that Mr. Penley commissioned him to adapt his novel for the stage, and that this has been practically done by Mr. Buchanan and his colleague in their Vaudeville play. But, inasmuch as all the authors in question seem alike to acknowledge their original indebtedness to Ten Thousand a Year, the discussion appears to have little beyond academic interest. The Romance of the Shopwalker, the origin of which is still being angrily discussed in some quarters, comes off at the Vaudeville this week. This is not because Messrs. Buchanan and Marlowe’s amusing domestic comedy was in any way failing in attractive power, but because Mr. Weedon Grossmith’s term at Messrs. Gatti’s theatre has come to an end. He proposes very shortly to take a tour round the country.